With the growing popularity of the History Channel's show Swamp People, a Cajun alligator themed party is sure to be a hit with your guests. While all Cajuns do not live in the bayou and "choot em" alligators, most of us do enjoy a good Cajun fais do-do. Here are some of our suggestions on how to have an alligator theme party! Cajun party invitations. Bring the Bayou home to your guests with a custom printed alligator invitation like these featured here. A personalized invitation sets the tone and theme for your Cajun event. Decorate for a swamp party with things found in a real swamp. Set your tables with natural textures like a burlap table cloth and tree stumps, cypress knees or branches. Layer in Spanish moss for an authentic swamp feel. Add a pirogue (the flat bottomed boat used in the bayou to navigate shallow water). Replica small wooden pirogues can be used on the table filled with greenery, party snacks or tiny alligator Mardi Gras beads like these pictured here. Let your guests take home a strand of alligator beads. Everyone gets their own gator! One big gator for the catch of the day! This alligator mylar balloon makes a great centerpiece. Fill the mylar balloon with air (not helium). Anchor the alligator to your tablescape by taping his belly to the table. Add a rope around his neck to make him look like the catch of the day. Alligator cookies make great party favors or snacks at the party. 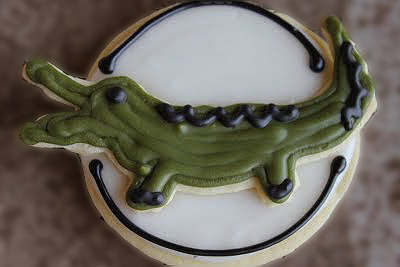 This fun alligator cookie was created by The Cookie Mama for a swamp people birthday celebration! The shaped alligator cookie mounted on the round cookie really makes the alligator stand out. A great idea...C'est si bon! Use alligator cookie cutters to create your own alligator cookies or alligator shaped snacks. Cookie cutters are great to cut out shaped snacks like finger sandwiches, rice crispy treats, pita/tortilla chips or cheese slices. For something more substantial than snacks serve Alligator Sauce Piquante. Cajun Sauce piquante is a spicy red sauce/stew that is served over rice. It can be made with any meat or seafood you choose, but alligator is perfect for this theme party. 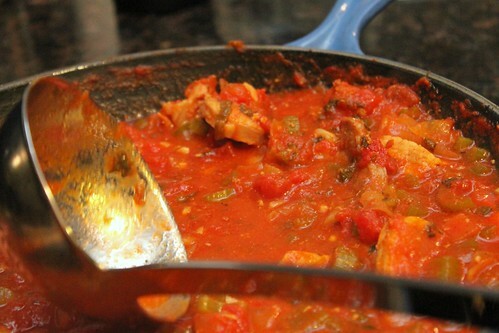 The recipe listed here is a version of Chef Folse's Alligator Sauce Piquante. In a heavy-bottomed pot, heat vegetable oil over medium-high heat. Whisk in flour, stirring constantly until a dark brown roux is achieved . Add alligator and saute 10 minutes or until well browned. Stir in onions, celery, bell peppers and minced garlic and saute 3-5 minutes or until vegetables are wilted. Stir in tomatoes, paste and water or stock. Blend well then season to taste with salt, pepper, Creole seasoning and hot sauce. Bring mixture to a rolling boil then reduce heat to medium. Simmer 2 hours or until meat is tender, adding water to retain volume if necessary. Add parsley and green onions and adjust seasonings to taste. Serve hot over steamed white rice. Note: It is recommended that you use alligator tail meat due to its texture and light to white color. Here are some ideas for party games to keep your little swamp people busy. Musical boats- Cut out pirogue shapes from cardboard or poster board. Let the children hop from pretend boat to boat until the music stops. Remove a boat each time just like musical chairs. Anyone left with out a boat is out or eaten by the gators. Last man in a pirogue wins! Fishing for Gators-Fill a small plastic swimming pool with water and alligator mardi gras beads. Mark hidden numbers on the bottom of each alligator. Using pieces rope with small S hooks tied on the ends let the children fish out the gators. See who can hook the biggest gator (largest number). Swamp scavenger hunt- Hide swampy things in the backyard like Spanish moss, pirogues, stuffed alligators, plastic crawfish, crabs, fish or spiders. Give the kids a lists of the items to hunt. The team or player who finds the most swamp items is crowned King/Queen of the swamp! Don't forget our fun alligator coloring page that makes a great party activity, too! To print out this free alligator coloring page, click here. Let party guests color at the party or take it home as a party favor with a pack of crayons. For more alligator themed party supplies, click HERE.